Pseudoplatystoma species are highly prized South American Pimelodid migratory catfishes. Until recently, their taxonomy was not clearly established, with discrepancies between morphological and molecular analyses. Here, Pseudoplatystoma species from the Peruvian Amazon were characterized at the molecular level from a sample representing the observed range of their color pattern variations in the study area. Analyses were performed using seven microsatellite loci for 103 specimens and, for part of them (52), using sequences of two regions of their mitochondrial genome [Cytochrome Oxidase subunit I (COI) and Control Region (CR)]. 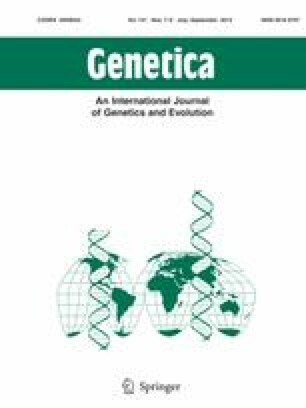 Factorial correspondence analysis and assignment tests based on microsatellite polymorphism showed that the specimens originally identified as P. punctifer belonged to two different gene pools highly differentiated from P. tigrinum. Morphological examination identified two different morphotypes (with and without black stripes), suggesting the existence of two distinct taxa within P. punctifer. This result was corroborated by the ML tree based on CR sequences, where all individuals but four clustered in a similar way as in the FCA and Bayesian assignment tests. For these four individuals, mitochondrial introgression or retention of ancestral polymorphism was likely. In contrast, the ML tree based on COI sequences showed that reciprocal monophyly was not yet achieved for this marker for the two P. punctifer taxa. The existence of three sympatric species of Pseudoplatystoma in the Peruvian Amazon is discussed in relation to their molecular characteristics, color patterns and ecology. Evolutionary scenarios regarding their divergence are hypothesized. This study was carried out within the Laboratoire Mixte International “Evolution et Domestication de l’Ichtyofaune Amazonienne” (LMI-EDIA) developed by the Instituto de Investigaciones de la Amazonia Peruana (IIAP) and the Institut Français de Recherche pour le Développement (IRD), both of which are part of the network Red de Investigación sobre la Ictiofauna Amazónica (RIIA http://www.riiaamazonia.org/). Financial support was provided by INCAGRO (Inovación para el Agro Peruano, subproject “Breeding and intensive production of fingerlings of Doncella Pseudoplatystoma fasciatum (Linnaeus, 1776) in the Peruvian Amazon”), IIAP and IRD.